"Samuel, are you worried about the elections? Do you think there will be violence like last time?" "No, mama Caleb. It will be peaceful. Raila will just win." "But what if he loses, or if it goes to a run-off. Do you think there be violence then?" "It won't happen because Raila will just win." "But what if he doesn't win." This went on for a while, and I literally couldn't get him to consider the possibility of a loss. His was not an isolated sentiment. There was a feeling that Raila had the momentum and the numbers. The election was stolen from him last time so, the logic goes, he should be a shoe-in now that the election commission has been depoliticized and international observers were keenly watching the process. Anyway, Raila's main opposition AND the running mate were indicted by the International Criminal Court for crimes against humanity, and Kenyans across he board were fearful of turning the country into an international pariah and taking the economy through retributive sanctions. Even though the polls had him neck and neck with Uhuru, it seemed he couldn't lose. People here didn't seem to be entertaining the thought. That's what worried me most in advance of the election. It implied there would be a level of suspicion and outrage should the outcome be in another direction. There was none of it. Raila called for peace even as he called "foul play" and insisted he'd work through the courts. Instead of taking to the streets, people seemed to whip straight through the 7 stages of grief, right to acceptance. Though plenty are stuck in sadness and quite a few in denial and anger. I've heard reactions ranging from "We're in mourning." to an angry "I'm never voting in this country again. What's the point?" But most have resigned themselves that "Uhuru will be our next president." I'm sad for those who are mourning or feel robbed. But at the same time I'm ... well, "proud" seems a bit patronizing and I don't mean it that way, but that's about the feeling... proud that Kenyans have chosen peace. Having a backdrop of violence can go one of two ways. Often it escalates. Violence begets violence, especially where grievances are given room to simmer and underlying issues remain unaddressed. There's nothing inevitable about this peaceful election. Over 1,000 families lost their loved ones and hundreds of thousands lost their homes last election. They are still in IDP camps. Those wounds are still festering. Many who experienced violence last time feared a reoccurance. But a backdrop of violence can also mean that people work harder to maintain peace, having tasted the ugliness of bloodshed that almost no one wanted. This appears to be the story in Kenya. In the five years since the last election, the electoral process was made more transparent, independent courts were set up, commissions to curb hate speech were erected, and a new constitution was passed which devolved authority to local levels where it can be held more accountable. While the vote counting was happening, there was a heavy policy presence in possibly volatile locations. 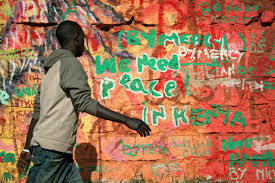 And Kenya is a relatively prosperous country, by neighborhood standards, in which people have a "stake in the peace." Even after the disappointing result, Kenyans in Kisumu seemed eager to get back to work. I really love this country, which has accepted my family with open arms. I love the patience, the curiosity, the warmth and the hospitality of the people here. Maybe I should stop intellectualizing and just be thankful to whatever forces aligned to keep the peace here in Kenya. P.S. I know there's a sense from some who feel wronged by the outcome and suspicious that votes were rigged that peace came at the expense of justice. I don't have a great answer for that. Hopefully the courts can prove or disprove any wrong doing. i must admit that i wasn't too keen on the idea of having an ICC suspect running our country but i kind of had to accept it. I just had to let it go and leave it up to the higher powers to decide what was best. i'm also so so proud of them for choosing peace. Like they need a pat on the back, seriously. Yeah, "proud" feels funny, but it's not easy to choose peace sometimes and I know plenty of people are still smarting from the loss and feel that there might have been some "funny business." I suppose we're not in the clear yet with the court case still pending (just spoke to someone yesterday who's pretty tapped in to more of the "rabble rouser" set and there is still potential for anger to boil over). But it's still admirable that everything went off so peacefully! Thanks for the comment! I'm so happy there is peace! Here, here, to peace, Kim. Interesting post. Thanks for filling me in on the after-election vibe in Kenya. Great post, Kim! It's good to hear an update from Kisumu, and even better that the update is so positive. I agree! Your comment about zipping through the 7 stages of grief is exactly right though I was so surprised to see it happen. We chatted to lots of people who were all voting for different candidates, and after the event they had been amazingly cool about it all. No real annoyance, just acceptance that this is how it's going to be, and let's go back to work now. We watched lots of people pack up and leave for the elections (most of the expat schools here are still down 10-20% of children who's parents said they weren't returning until after the Easter holidays) and we bought in our water and dried goods......and are now eating through them! It has been a huge relief, and even though the court process is ongoing, no-one envisages any violence. Proud is a good word, and while I equally don't want to sound patronising, well done Kenya! You showed the world how it's done. And yah-boo-shucks to the BBC and Sky News who sent shed loads of people over to cover the violence - sorry, nothing to see!!!! Thanks for the links Neil. Just read the first one, and it is pretty depressing. It's a lot easier for me, as a foreigner, to forget (or simply not appreciate) the history and all the baggage each political candidate has attached to him, and focus on the positive aspects, like peace and a new constitution. But looking at things differently is certainly more jading! Looking forward to reading the second piece too! Thanks for stopping by!